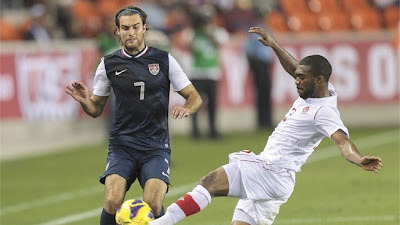 On the last Tuesday evening of January 2013, the United States and Canadian National Teams faced off for a friendly at BBVA Compass Stadium in Houston, Texas, slogging out a 0-0 draw. In the end, the match was a reminder of what U.S. Soccer fans should already know (though they often live in denial of it), which is that the US National Team does not have a substantial amount of depth. Tuesday's match came at the end of what is know affectionately as "Camp Cupcake," that January US National Team camp where lots of MLS players get a chance to train together under the watchful eyes of Jürgen Klinsmann. Since the camp and the match did not fall within a FIFA sanctioned international break on the football calendar, the majority of the US's A Squad was still in Europe with their professional clubs. In light of the lack of any real importance surrounding Tuesday's match and the fact that none of the US players really stood out with an exceptional performance, it's not worth wasting time breaking down the lackluster match. Additionally, Canada pretty much parked the bus from the beginning showing little interest in scoring a goal of its own. Some of the players from Tuesday will likely end up on the bench in some of the upcoming CONCACAF World Cup Qualifiers, but probably won't see any significant playing time till the Gold Cup this summer. Speaking of the upcoming World Cup Qualifiers, Tuesday's match is not an indication one way or the other as to how the US is going to do. My prediction is that the US National Team will advance through the Hex to the 2014 World Cup finals in Brasil, but there will be some rough spots along the way, a loss or two while on the road. These losses will freak out many a US Soccer fan with the requisite hysterics and twitter meltdowns, but the reality is that CONCACAF is not a cakewalk, the US National Team has certain flaws - with its lack of depth being the biggest flaw - and it is irrational to assume that the US squad is going to make it through the Hex undefeated.